Free shipping on all rectangular gable vents! Our gable vents are available in a wide variety of sizes and styles. 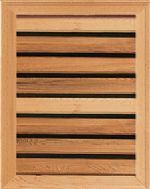 They are constructed of rot-resistant western red cedar on all exposed exterior components and feature louvers with a "rain-stop" design to guard against wind-driven rain. A nylon screen backing will keep out unwanted insects. All gable vents are built 1/2" under rough opening sizes. For more information on the construction of our gable vents click here.